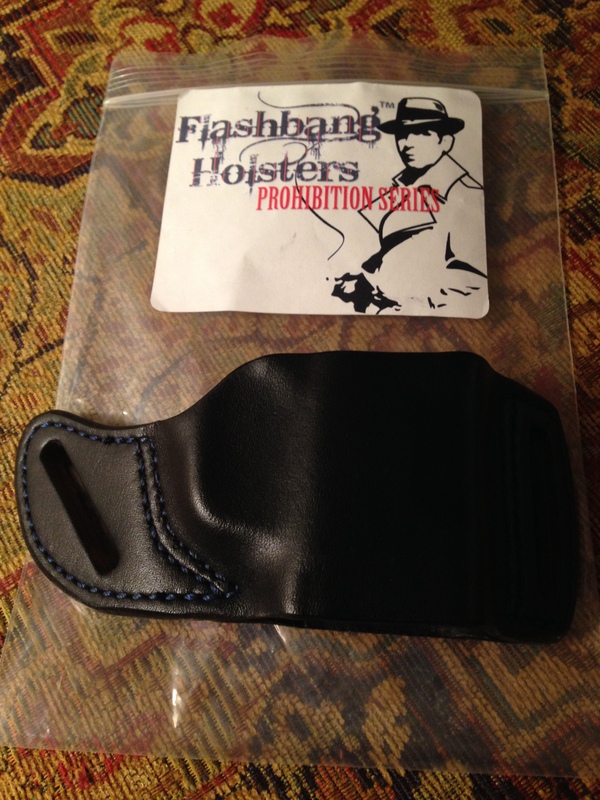 This is the second half of the Flashbang holsters review. Part 1, if you didn’t see it can be found on Mid-Ohio IMB’s blog page (wordpress) under the category of The Trigger Press. 1. 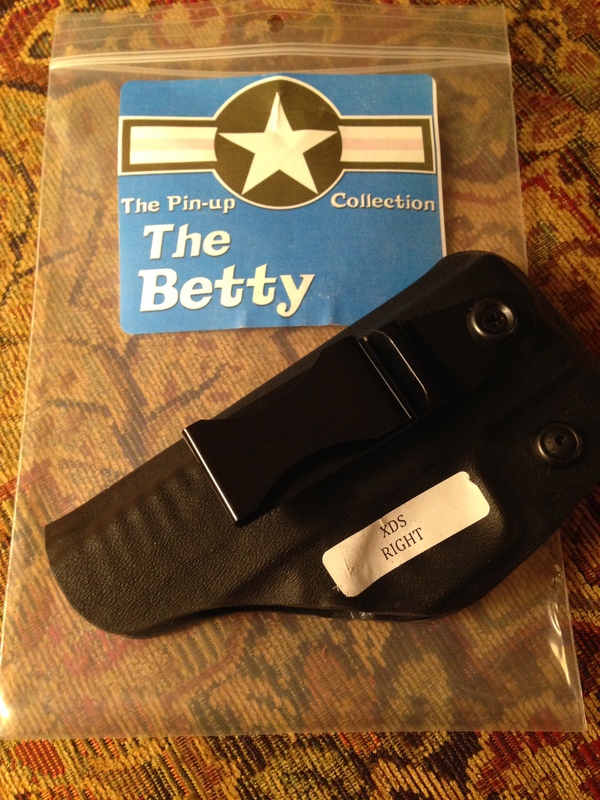 The Betty (men’s version; The Elliot Ness)– At first glance, the Betty looks like your typical inside the waistband holster; minimal, black and a clip to hold onto the clothing. But check it out a little closer and you’ll see some differences that really make it stand out. The Kydex is very thin, on purpose. The point there is to minimize bulkiness while still supporting the firearm. As opposed to a standard opening for the firearm to slip into the holster, it has a clamshell opening (meaning that instead of the holster opening being the same depth all the way around, the holster tapers down and opens slightly on the trigger guard side). The point of this feature is to minimize size and bulk. Some might find this a safety issue, but even though the holster is minimized on the underside, the trigger is still completely covered. And the only way it would ‘slip’ out of the holster is if I were walking on my hands upside down, which I’m not so we’re good (because nobody would want to see that). Is it looser than other holsters? Yes, but not so much that it becomes a problem. It still ‘snaps’ into the holster, just not as snug as others. The clip swivels (or the holster swivels, depending on your point of view), allowing for various positioning inside the waistband. If you’ve ever had that poke or pinch from your holster and tried to adjust but there’s just no other way to position it due to the stationary clip, then you can appreciate the usefulness of this feature. Being able to move your gun to a comfortable position while still maintaining a good deployment position is definitely a bonus. The moveable clip also allows for great angles if you prefer cross-body, lower back, or hip placement for the holster. 2. 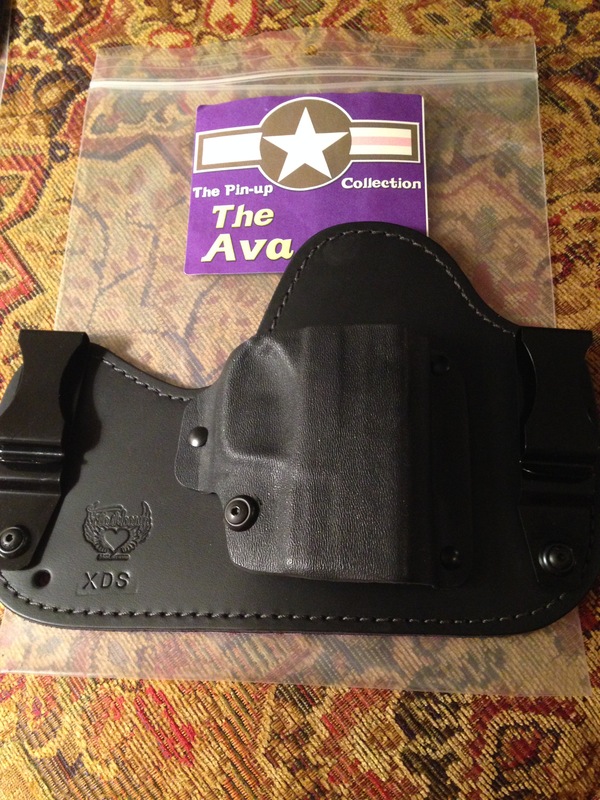 The Ava (men’s version; The Capone) – This is Flashbang’s largest holster. It’s a Kydex holster mounted on leather large enough to wrap around your body a couple inches on either side of the Kydex portion. The leather is thinner and more pliable than other holsters like it I’ve tried, and the Kydex holster still grips the gun well. What makes the Ava stand out to me from others with similar construction was how it hugged my curves no matter where I placed the holster. It wrapped around whether placed in a true 4 o’clock position, directly on my hip or more toward the front of my body. There are clips to grip the clothing or a belt on either end of the holster. And again, the feminine feature is on the inside: It’s lined with purple suede. Functional and fashionable, thin enough to minimize the bulk, but sturdy enough to handle the job. 3. The Sophia (men’s version; The Mad Dog) – This is Flashbang’s leather outside the waistband holster. A belt (like the ones Flashbang makes) is fed through either end to hold it snugly in place around your waistline. I have a couple other holsters of this type and found them okay, adequate, and they performed their task nicely. But I never really had the ‘damn! This feels good’ moment until I wore the Sophia. R & D sure got this one right for women (or men) with curves. It lays perfectly on the top of my hip right around my waistline. The grip of the gun fits against my body and doesn’t protrude, as some others do. Because of the close wear to my body, clothing options become greater. I wouldn’t really mention that point except we all know that outside the waistband carry really does limit what you wear, unless it’s below 40 degrees and there’s a need for layering. One suggestion: If you buy one, make sure to practice deploying the firearm (unloaded) a few times. It’s a stiff leather holster (which is a good thing) that can grab the gun pretty aggressively if not worked a little. I did this to my holster and found the deployment was fine afterward. So what was my take on Flashbang after reviewing some of their holsters and accessories? It’s well worth your time to explore ALL the holsters and accessories they have to offer. I’ve often heard chatter that the holster industry needs to be more in tune to women’s needs. I’d say Flashbang did a fine job of recognizing the need and delivering on product. I just didn’t realize their selection was anything other than their original bra holster. What’s more, the entire men’s line of holsters looks great too. My husband, Andy, is very curious. It’s possible you’ll see a review from him in the future on the Elliot Ness, Mad Dog or the Capone in the near future.